Want to know more about Newfoundland dogs? - Neufundländer "Bär vom Ermstal"
Want to know more about Newfoundland dogs? The Newfoundland dog is a large working dog. Newfoundland dogs can be black, brown , white& black or gray. However, in Canada, the country of their origin, the only correct colours are black or white and black (Landseer). The "Landseer" pattern is named after the artist Sir Edwin Henry Landseer, who featured them in many of his paintings. 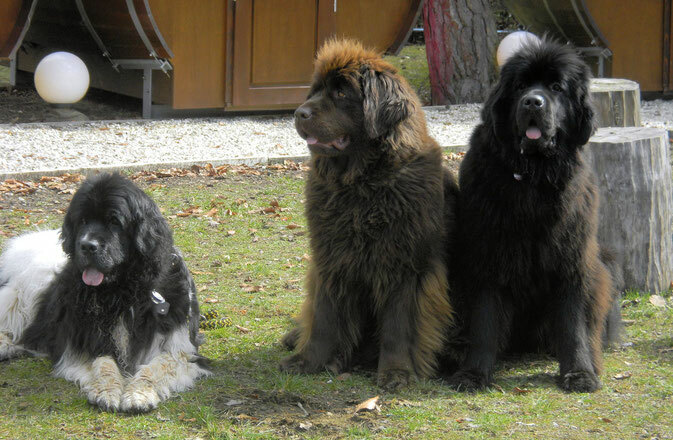 Fédération Cynologique Internationale (FCI) consider the ECT Landseer ("European Continental Type") to be a separate breed. 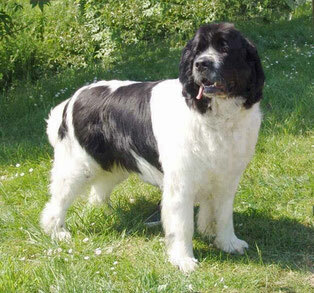 It is a taller, more narrow white dog with black markings, not bred with a Newfoundland. Newfoundland ('Newfs' or 'Newfies') males normally weigh 60–70 kg (130–150 lb), and females 45–55 kg (99–121 lb), placing them in the "Giant" weight range; but some Newfoundland dogs have been known to weigh over 90 kg (200 lb) – and the largest on record weighed 120 kg (260 lb) and measured over 1.8 m (6 ft) from nose to tail. 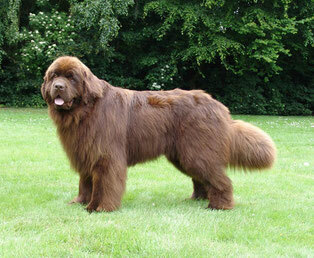 Newfoundlands were originally bred and used as a working dog for fishermen in the Dominion of Newfoundland. They are known for their giant size, intelligence, tremendous strength, calm dispositions, and loyalty. These dogs have great lung capacity for swimming extremely long distances, and a thick, oily and waterproof double coat which protects them from the chill of icy waters. The droopy lips and jowls make the dog drool. In the water, the dog's massive webbed paws give it maximum propulsion. The swimming stroke is not an ordinary dog paddle. Unlike other dogs, the Newfoundland moves its limbs in a down-and-out motion. This gives it more power with every stroke. The Newfoundland dog is known for its calm and docile nature and its strength. They are highly loyal and make ideal working dogs. It is for this reason that this breed is known as "the gentle giant". It typically has a deep bark, and is easy to train if started young. They are wonderfully good with children, but small children can get accidentally leaned on and knocked down. The breed was memorialized in "Nana", the beloved guardian dog in J.M. Barrie's book ‚Peter Pan. 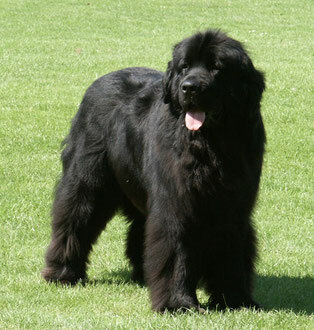 The Newfoundland in general is good with other animals, but its size can cause problems if it is not trained.